Rider Safe is a compulsory motorcycle rider training course for all novice motorcycle riders. It provides tuition for the basic and advanced motorcycle skills necessary for the road. Rider Safe is run by experienced motorcycle riders who have undergone specialised instructor training. The Rider Safe course also provides the opportunity to determine your riding aptitude before buying a motorcycle. If you do not hold a current driver's licence, you must first pass the theory test at a customer service centre see the Theory Test. 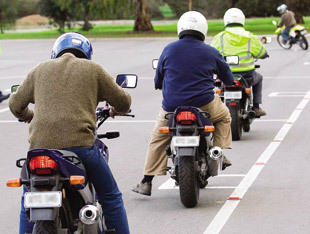 You must then undertake the basic Rider Safe course before a learner's permit can be issued. Payment for the course must be made at a customer service centre before attending Rider Safe. If you have not previously held a driver's licence, you must hold your learner's permit for a minimum of 12 calendar months if you are under the age of 25, or six months if you are aged 25 or over, and pass an advanced Rider Safe course before you can be issued with a motorcycle licence. 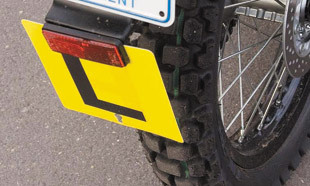 You will be restricted to an R-Date licence for the first twelve months of your motorcycle licence, refer to the Learner Approved Motorcycle Scheme (LAMS) section. Depending on your individual circumstances, different scenarios can apply if your learner's permit is disqualified. Please telephone 13 10 84 for details. Under the scheme, R-Date licence holders are allowed to ride motorcycles with an engine capacity of up to 660 ml with a power-to-weight ratio not exceeding 150 kw/t. A list of approved motorcycles is available from any Customer Service Centre or the website www.sa.gov.au/motoring . R-Date licence - can ride bikes up to 660 ml engine capacity and power to weight ratio not exceeding 150 kw/t. R licence - full rider's licence, can ride any bike (must have held an R-Date licence for at least 12 months). If you hold a learner's permit for a motorcycle and do not hold a P2 or full licence for another class of vehicle, you must not ride between midnight and 5AM unless a Qualified Supervising Driver is present or you have an exemption. This course is delivered in two half-day sessions (session A and B over two days). In Session A you will learn basic motorcycle control skills including riding in a straight line, basic braking, cornering, gear shifting and some bike control theory. In Session B your learning will build on from session A by interacting with other bikes on the riding range. This session covers more advanced bike control theory and traffic skills. A practical skills assessment will be conducted at the end of session B. Upon successful completion of the Basic Course, you have 12 months to present the endorsed Approval to Obtain a Learner's Permit form at any Customer Service Centre to obtain a learner's permit form at any Customer Service Centre to obtain a learner's permit. Failure to do so will result in you re-sitting the Basic course. The permit is valid for two years and you must carry your permit at all times whilst riding. This course is delivered in one half-day session (Session C). In Session C you will learn advanced bike control skills with emphasis placed on road riding skills and traction theory. A practical skills assessment will be conducted at the end of the advanced course. On successful completion of the Advanced Course, you must present your Certificate of Competency at any Customer Service Centre to receive your R-Date Licence. This licence entitles you to ride a motorcycle on the learner approved motorcycle scheme list which can be found by visiting www.sa.gov.au/motoring or by contacting 13 10 84. After completing a 12-month period riding on a Restricted R-Date Licence, you may apply for an unrestricted "R" class licence. This licence is required if you wish to ride any motorcycle. The Returning Rider Course is a voluntary course aimed at people who hold a motorcycle licence but have not ridden for at least 5 years. The course is designed to refresh your riding skills, techniques and awareness. It is not a test. The session involves both theory and practical components that have been developed by experienced motorcyclists who have undergone specialist instructor training.